British comedianEddie Izzard ‘cannot run for freedom this Friday if he entertains in Tel Aviv on Thursday’, say Palestine Marathon organisers. ‘We refuse to be used as a fig leaf to cover up Izzard’s whitewashing of Israel’s occupation and apartheid’ Palestinian campaigners commented. 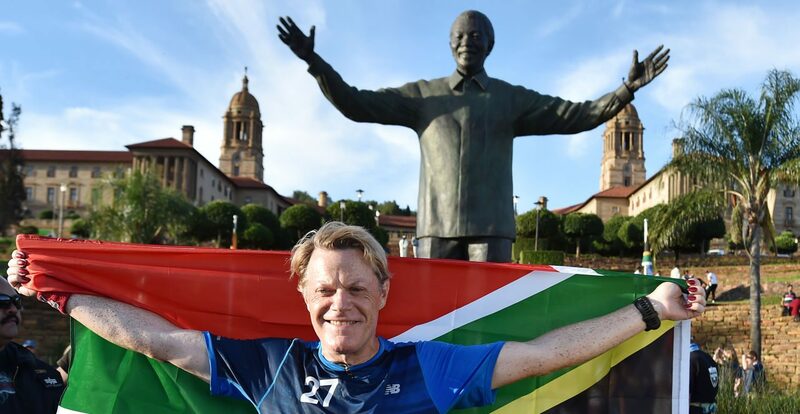 Eddie Izzard, who ran 27 marathons in tribute to Mandela in 2016, and who is a UNICEF ambassador, should be consistent and stand against Israeli Apartheid, say Artists for Palestine UK. Artists for Palestine UK (APUK), whose Artists’ Pledge for Palestine has over 1200 signatories, has been campaigning for British comedian Eddie Izzard to withdraw from his projected March 30 gig in Tel Aviv. http://bit.ly/2lG7lIz – and running in the Palestine Marathon on the 31 March! Now Palestine Marathon organisers have sent back his registration. The Palestinian Campaign for the Cultural and Academic Boycott of Israel, commented: ‘Eddie Izzard is not welcomed in the Palestine marathon after he has crossed our boycott picket line. Today, performing in Tel Aviv is equivalent to performing in Sun City during the time of apartheid, and there is no balancing act that can justify violating the Palestinian boycott call. We refuse to be used as a fig leaf to cover up Izzard’s whitewashing of Israel’s occupation and apartheid’. Very disappointing. I thought he was better than that.